Standing tall to its morals and principles, Rashtriya Swayamsevak Sangh (RSS) turns 87 on today, on the auspicious occasion of Vijayadashami. It was founded in 1925 by K. B. Hedgewar, a revolutionary and doctor from Nagpur, as a social and cultural organization in British India. RSS volunteers participated in various political and social movements including the freedom movement and the organization became the leading nationalist Hindu organization in India. By the 1990s, the group had established numerous schools, charities and clubs to propagate its ideology. Its volunteers are also known for their role in the relief and rehabilitation work during natural calamities and for running more than 100,000 service programs in the field of education, health care, rural development, tribal emancipation, village self-sufficiency, Farming Programmes in rural India and the rehabilitation of lepers and special needs children. It was banned by the British, and then after independence three times by the Government of India — first in 1948 when Nathuram Godse, an alleged former member who left RSS, assassinated Mahatma Gandhi; then during emergency (1975–1978); and after the Demolition of Babri Masjid in 1992. RSS was founded in 1925 by Dr. Keshav Baliram Hedgewar, who was a doctor in the central Indian city of Nagpur. 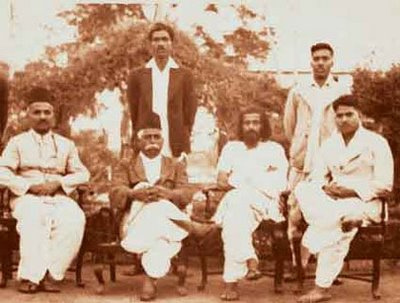 Hedgewar as a medical student in Kolkatahad been a part of the revolutionary activities of the Anushilan Samiti and Jugantar striving to free India from British rule. He had been charged with sedition in 1921 by the British Administration and was imprisoned for one year. Hedgewar was educated by his elder brother. After matriculating, he decided to go to Kolkata to study medicine. He was sent to Kolkata by Dr. B. S. Moonje in 1910 to pursue his medical studies. There he lived with Shyam Sundar Chakravarthy and learned the techniques of fighting from the secret revolutionary organisations like the Anushilan Samiti and Jugantar in Bengal. He is said to have joined Anushilan Samiti and had contacts with revolutionaries like Ram Prasad Bismil. Previously he was involved in such type of revolutionary activities, This fact has been disclosed by so many writers viz. C.P.Bhishikar,M.S. Golwalkar,K.S.Sudarshan and Rakesh Sinha previously. He came to believe that although the revolutionaries had immense determination, in a country of continental proportions it was impossible to instigate an armed insurrection. After completing his graduation, he returned to Nagpur, disillusioned with the armed movement. In his memoirs, the third chief of RSS, Balasahab Deoras narrates an incident when Hedgewar saved him and others from following the path of Bhagat Singh and his comrades. Later he left the revolutionary organisations in the year 1925 and formed the Rashtriya Swayamsevak Sangh. Since Hedgewar was primarily associated with the Hindustan Republican Association so he adopted the full constitution of erstwhile HRA and implemented it forcibly in his newly established organisation RSS later on. The RSS first met in 1925 just after two months of Kakori train robbery in a small ground of Nagpur with 5-6 persons on Vijaya Dashami. After the formation of the RSS, Hedgewar kept the organization away from having any direct affiliation to any of the political organisations then fighting British rule. But Hedgewar and his team of volunteers, took part in the Indian National Congress, led movements against the British rule. Hedgewar was arrested in the Jungle Satyagraha agitation in 1931 and served a second term in prison. The Partition of India was a very traumatic event in the young nation’s history with millions of Sikhs, Hindus, and Muslims attempting to escape the violence and carnage that followed. Noted Gandhian and recipient of the highest civilian award in India, Bharat Ratna, Dr. Bhagwan Das commended the role of the “high-spirited and self-sacrificing boys” of the RSS in protecting the newly formed Republic of India, from a planned coup to topple theJawaharlal Nehru Administration in Delhi. Following Mahatma Gandhi’s assassination in 1948 by a former member of the RSS, Nathuram Godse, many prominent leaders of the RSS were arrested and RSS as an organization was banned on February 4, 1948. 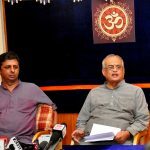 RSS Leaders were acquitted of the conspiracy charge by the Supreme Court of India and following an intervention by the Court, the Indian Government agreed to lift the ban with condition that the RSS adopt a formal constitution. The second Sarsanghachalak, Golwalkar drafted the constitution for the RSS which he sent to the government in March 1949. In July of the same year, after many negotiations over the constitution and its acceptance, the ban on RSS was lifted. On January 15, 2000, a daily, The Statesman, carried a story about the RSS by A G Noorani, which depicted the RSS as the killer of Gandhi. 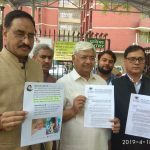 Subsequently the Delhi unit of the RSS filed a criminal case of defamation against author of the article A G Noorani along with the cartoonist and the Managing Director of the publishing house. When two of the accused did not respond to the Court summons, non-bailable warrants were issued in their name by the Court. On February 25, 2002, Noorani wrote an unconditional apology to the court in which he regretted writing the defamatory article against the RSS. On March 3, 2002, ‘The Statesman’ also published an apology regretting the publication of the said article. After the independence of India, RSS was one of the socio-political organisations who aspired to liberate Dadra and Nagar Haveli from Portuguese occupation. 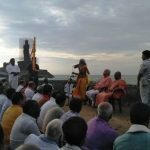 In early 1954, volunteers Raja Wakankar and Nana Kajrekar of the RSS visited the area round about Dadra and Nagar Haveli and Daman several times to study the topography and also to get acquainted with the local workers who were agitating for the liberation. In April 1954, the RSS formed a coalition with the National Movement Liberation Organization (NMLO), the and Azad Gomantak Dal (AGD) for the liberation of Dadra and Nagar Haveli. On the night of 21 July, United front of Goans, a group, working independently of the coalition, captured the Portuguese police station at Dadra and declared Dadra as free. Subsequently on 28 July, volunteer teams of the RSS and AGD captured the territories of Naroli and Phiparia and ultimately the capital of Silvassa. The Portuguese forces which escaped and moved towards Nagar Haveli, were assaulted at Khandvel and were forced to retreat till they surrendered to the Indian border police at Udava on 11 August 1954. A native administration was set up with Appasaheb Karmalkar of NMLO as the Administrator of Dadra and Nagar Haveli on 11 August 1954. The liberation of Dadra and Nagar Haveli gave a boost to the freedom movement against the Portuguese in Goa. In 1955, RSS leaders demanded the end of Portuguese rule in Goa and its integration into India. When Prime Minister of India, Jawaharlal Nehru refused to obtain it by armed intervention, RSS leader Jagannath Rao Joshi led the satyagraha agitation straight into Goa itself. He was imprisoned with his followers by the Portuguese police. The peaceful protests continued but met with severe repressions. On 15 August 1955, the Portuguese police opened fire on the satyagrahis, killing thirty or so people. The RSS which had been keeping low profile after the lifting of the ban, earned recognition based on its volunteer work during the Sino-Indian War in 1962. RSS was invited by Prime Minister Jawaharlal Nehru to take part in the Indian Republic day parade of 1963. It along with several other civilian organizations took part in the parade. This event helped the RSS increase its popularity and its patriotic image. Later in 1965 and 1971 Indo-Pak wars too, the RSS volunteers offered their services to maintain law and order of the country and were apparently the first to donate blood. In 1975, the Indian Government under the Prime Minister Mrs. Indira Gandhi, proclaimed emergency rule in India, thereby suspending the fundamental rights and curtailing the rights of the press. This extreme step was taken after the Supreme Court of India, cancelled her election to the Indian Parliament on charges of malpractices in the election. The democratic institutions were kept under suspended animation and prominent opposition leaders including Gandhian Jayaprakash Narayan, were arrested and thousands of people were detained without any charges being framed against them. RSS, which was seen close to opposition leaders, and with its large organizational base was seen to have potential of organizing protests against the Government, was also banned.Police clamped down on the organization and thousands of its workers were imprisoned. The RSS defied the ban and thousands participated in Satyagraha (peaceful protests) against the ban and against the curtailment of fundamental rights. Later, when there was no letup, the volunteers of the RSS formed underground movements for the restoration of democracy. Literature that was censored in the media was clandestinely published and distributed on a large scale and funds were collected for the movement. Networks were established between leaders of different political parties in the jail and outside for the coordination of the movement. It said that the movement was “dominated by tens of thousands of RSS cadres, though more and more young recruits are coming”. Talking about its objectives it said “its platform at the moment has only one plank: to bring democracy back to India”. The Emergency was lifted in 1977 and as a consequence the ban on the RSS too was lifted. It has been noted that the RSS volunteers participated in the Bhoodan movement organized by Gandhian leader Vinobha Bhave. Vinobha Bhave had met the RSS leader M. S. Golwalkar in Meerutin November 1951. Golwalkar had been inspired by the movement that encouraged land reforms through voluntary means. He pledged the support of the RSS for this movement. Consequently, many RSS volunteers led by Nanaji Deshmukh participated in the movement. But Golwalkar has also been critical of the Bhoodan movement, on other occasions for being reactionary and for working “merely with a view to counteracting Communism”. He believed that the movement should inculcate a right and positive faith in the masses that can make them rise above the base appeal of Communism. RSS does not have any formal membership. According its websites like www.samvada.org , a Hindu male can become member by joining the nearest ‘Shakha’, which is the basic unit. Although the RSS claims not to keep membership records, it is estimated that the organization has 6 million members. The position is decided through nomination by predecessor. 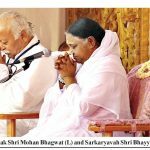 The current Sarsanghachalak of RSS is Dr. Mohan Madhukar Bhagwat. “Shakha” is Hindi for “branch”. Most of the organizational work of the RSS is done through the coordination of shakhas or branches. These shakhas are run for 1 hour in public places. 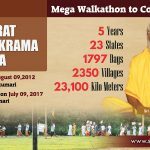 In 2004, more than 60,000 shakhas were run throughout India. However the number of Shakas has fallen by over 10,000 since the fall of the Bharatiya Janata Party (BJP) led government in 2004. The shakhas conduct various activities for its volunteers which include physical fitness activities through yoga, exercises and games. It has other activities which emphasize on qualities like civic sense, social service, community living and patriotism. The volunteers are trained in first aid and in rescue and rehabilitation operations. The volunteers are also encouraged to get involved in the developmental activities of the village or locality. The emblem that has been chosen is the Bhagawa Dhwaj(saffron flag), which brings before the eyes the living of the ancient, sacred and integrated national life in all its pristine purity and entirely crossing all superficial barriers of province, sect, creed, cast, language and custom. Since times immemorial, it has been the symbol of Indian dharma, the Indian culture, Indian traditions and ideals. It has witnessed the rise and fall of empires, the penance of yogis and sacrifice of heroes and symbolised the dreams of countless millions of the land all through the ages.In short, it has been the highest, the noblest and the truest symbol of our nationhood. For swayamsevaks who work in information technology (IT) related sectors another form of Shakha is set, called as “IT Milan”. These are weekly meetings unlike the regular Shakhas which run daily. IT Milans are observed in many IT cities in India – Bangalore, Chennai, Delhi, Hyderabad, Pune. There are as many as 3,000 techies in Bangalore who meet regularly this way. This 60–90 minutes weekly gathering includes a Prayer, Surya Namaskara, Yoga, games, song and sermon. 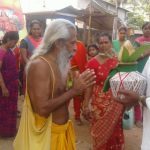 IT Milans are user friendly; the prayer is available as a printout, usually everyone is addressed in English, and there are enough people to aid newcomers on the Surya Namaskara and seven yoga asanas. These exercises have been designed for IT professionals who suffer from chronic lower backache due to long hours at computers. It also helps that their employers respect their RSS links. Games are played during the Milan to relieve tension in the minds of IT Swayamsevaks and foster team spirit. An IT Milan also serves as a forum for discussion on various issues of national and international importance. The mission of Rashtriya Swayamsevak Sangh has been described as the revitalization of Indian value system based on universalism and peace and prosperity to all. 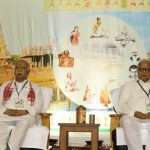 Vasudhaiva Kutumbakam, the worldview that the whole world is one family, propounded by the ancient thinkers of India, is considered as the ultimate mission of the organization. But the immediate focus, the leaders believe, is on the Hindu renaissance, which would build an egalitarian society and a strong India that could propound this philosophy. Hence, the focus is on social reform, economic upliftment of the downtrodden and the protection of cultural diversity of the natives in India. 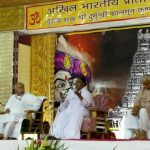 The organization says, it aspires to unite all Hindus and build a strong India, which could contribute to the welfare of the world. In the words of RSS ideologue and the second head of the RSS, M S Golwalkar, “in order to be able to contribute our unique knowledge to mankind, in order to be able to live and strive for the unity and welfare of the world, we stand before the world as a self-confident, resurgent and mighty nation”. RSS has been making determined efforts to inculcate in our people the burning devotion for Bharat and its national ethos; kindle in them the spirit of dedication and sterling qualities and character; rouse social consciousness, mutual good-will, love and cooperation among them all; to make them realise that casts, creeds and languages are secondary and that service to the nation is the supreme end and to mold their behaviour accordingly; instill in them a sense of true humility and discipline and train their bodies to be strong and robust so as to shoulder any social responsibility; and thus to create all-round Anushasana in all walks of life and build together all our people into a unified harmonious national whole, extending from Himalayas to Kanyakumari. Golwalkar also explains that RSS does not intend to compete in electioneering politics or share power. He asserts that there is no place in RSS for any hatred or opposition towards any particular caste, creed or party. 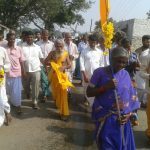 The movement considers Hindus as inclusive of Sikhs, Jains, Buddhists, tribals, untouchables, Veerashaivism, Arya Samaj, Ramakrishna Mission, etc. as a community, a view similar to inclusive referencing of the term Hindu in the Indian Constitution. Organizations which are inspired by the Rashtriya Swayamsevak Sangh’s ideology refer themselves as the members of the Sangh Parivar. In most of the cases, pracharaks (full-time volunteers of the RSS) were deputed to start and manage these organizations. The organizations within the Sangh include the Vishwa Hindu Parishad, Vanbandhu Parishad, Rashtriya Sevika Samiti, Akhil Bharatiya Vidyarthi Parishad, Vanavasi Kalyan Ashram, Bharatiya Mazdoor Sangh, Vidya Bharati, Seva Bharati and many others spread in all parts of society. Numerous other Hindu organizations take inspiration from the RSS’s philosophy. RSS has never directly contested elections, but supports parties that are ideologically similar. Although RSS generally endorses the Bharatiya Janata Party (BJP), yet at times had refused to do so due to difference of opinion with the party. Also, RSS is open to support any political party that subscribes to its views. Christophe Jaffrelot finds that “there is insuficient data available to carry out a statistical analysis of social origins of the early RSS leaders” but goes on to conclude, based on some known profiles that most of the RSS founders and its leading organisers, with exceptions were Maharashtrian Brahmins from middle or lower class and argues that the pervasiveness of the Brahminical ethic in the organisation was probably the main reason why it failed to attract support from the low castes. He argues that the “RSS resorted to instrumentalist techniques of ethno-religious mobilisation – in which its Brahminism was diluted – to overcome this handicap.” However Anderson and Damle 1987, find that members of all castes have been welcomed into the organisation and are treated as equals. During M. K. Gandhi’s visit to RSS Camp accompanied by Mahadev Desai and Mirabehn at Wardha in 1934, he was surprised by the discipline and the absence of untouchability in RSS and commented “When I visited the RSS Camp, I was very much surprised by your discipline and absence of untouchablity.” He personally inquired to Swayamsevaks and found that they were living and eating together in the camp without bothering to know their castes. Dr Bhimrao Ambedkar while visiting the RSS camp at Pune in 1939 observed that Swayamsevaks were moving in absolute equality and brotherhood without even caring to know the cast of others. 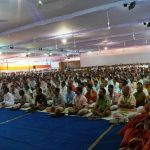 In his address to the Swayamsevaks, he said that ” This is the first time that I am visiting the camp of Sangh volunters. I am happy to find absolute equality between Savarniyas (Upper cast) and Harijans (Lower cast) without any one being aware of such difference existing.” When he asked Dr Hedgewar whether there were any untouchables in the camp, he replied that there are neither “touchables” nor “untouchables” but only Hindus. 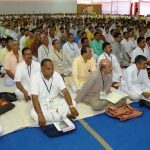 It is noted that RSS is taking a lead role in providing the education to people of rural India and socially backward classes living under the extreme poverty. This is a long and continuous tradition with the RSS. The RSS was instrumental in relief efforts after the 1971 Orissa Cyclone and the 1977 Andhra Pradesh Cyclone. An RSS-affiliated NGO, Seva Bharati, has adopted 57 children (38 Muslims and 19 Hindus) from militancy affected areas of Jammu and Kashmir to provide them education at least up to Higher Secondary level. They have also taken care of many victims of the Kargil War of 1999. This is an old tradition in the RSS. To be the first at any disaster strike: floods, cyclone, drought and now quake. In Kutch, too, the RSS was the first to reach the affected areas. At Anjar, a town in ruins, the RSS was present much before the Army took the lead in finding survivors and fishing out the dead. Literally within minutes RSS volunteers were at the scenes of distress. Across Gujarat, the (RSS) cadres were the saviors. Even as the state machinery went comatose in the first two days after the quake, the cadre-based machinery of the Sangh fanned out throughout the state. Approximately 35,000 RSS members in uniform were pressed into service. Seva Bharati conducted relief operations in the aftermath of the 2004 Indian Ocean earthquake. Activities included building shelters for the victims, providing food, clothes and medical necessities. 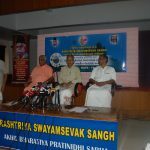 The RSS assisted relief efforts during the 2004 Sumatra-Andaman earthquake and the subsequent tsunami. In 2006, RSS participated in relief efforts to provide basic necessities such as food, milk and potable water to the people of Surat, Gujarat who were affected by massive floods in the region. The RSS volunteers carried out massive relief and rehabilitation work after the floods ravaged North Karnataka and some districts of the state of Andhra Pradesh. 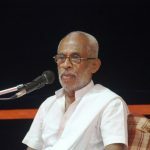 According to Cho Ramaswamy, the editor of Tughlaq magazine, the RSS-sponsored Sewa Bharati did yeoman service following the 2004 Indian Ocean tsunami, despite a lack of formal acknowledgment. RSS helped protecting Sikhs during 1984 Anti-Sikh Riots. Sikh intellectual and author of ‘A History of the Sikhs’, Khushwant Singh, credits members of the RSS with helping and protectingSikhs who were being targeted by members of the Congress(I) political party during the 1984 Anti-Sikh Riots. RSS has played an honorable role in maintaining Hindu-Sikh unity before and after the murder of Indira Gandhi in Delhi and in other places It was the Congress (I) leaders who instigated mobs in 1984 and got more than 3000 people killed. I must give due credit to RSS and the BJP for showing courage and protecting helpless Sikhs during those difficult days. No less a person than Atal Bihari Vajpayee himself intervened at a couple of places to help poor taxi drivers. Many cases have been reported in post-independence India where RSS volunteers have been discriminated against by the government due to their allegiance to the RSS. In a court case of a teacher who was dismissed from service due to his past links with the RSS, the Supreme Court labeled the government’s action as “McCarthyism” and a “violation of fundamental rights”. A municipal school teacher, Ramshanker Raghuvanshi, was dismissed by the Congress government of Madhya Pradesh in 1974, which stated that he had taken “part in the RSS” activities and hence was “not a fit person to be entertained in Government service”. The Supreme Court dismissed the arguments of the government and said that the government had not adhered to the provisions of the Indian Constitution. The Supreme Court bench consisting of Justice Syed Murtuza Fazalali and Justice O. Chinnappa Reddy observed that “India is not a police state” and pleaded that the “promise of fundamental rights enshrined in the Indian Constitution not become a forgotten chapter of history”. Delivering the landmark judgment, the Court observed that “seeking a police report on person’s political faith”, in the first place, “amounted to the violation of fundamental rights”. The Supreme Court ruled in favor of the municipal teacher and ordered his reinstatement. Prima facie the RSS is a non-political cultural organization without any hatred or ill will towards non-Hindus and that many eminent and respected persons in the country have not hesitated to preside over the functions or appreciate the work of its volunteers. In a country like ours which has accepted the democratic way of life (as ensured by the Constitution), it would not be within reason to accept the proposition that mere membership of such peaceful or non-violent association and participation in activities thereof, will render a person (in whose character and antecedents there are no other defects) unsuitable to be appointed to the post of a Munsiff. The RSS also has been banned in India thrice, during periods in which the government of the time claimed that they were a threat to the state: in 1948 after Mahatma Gandhi’s assassination, during the Emergency (1975–77), and after the 1992 Babri Masjid demolition. The bans were subsequently lifted, in 1949 after the RSS was absolved of charges in the Gandhi murder case, in 1977 as a result of the Emergency being revoked, and in 1993 when no evidence of any unlawful activities was found against it by the tribunal constituted under the Unlawful Activities (Prevention) Act. Dr Zakir Hussain the former President of India once told to Milad Mehfil in Monghyar on November 20, 1949 “The allegations against RSS of violence and hatred against Muslims are wholly false. Muslims should learn the lesson of mutual love, cooperation and organization from RSS.